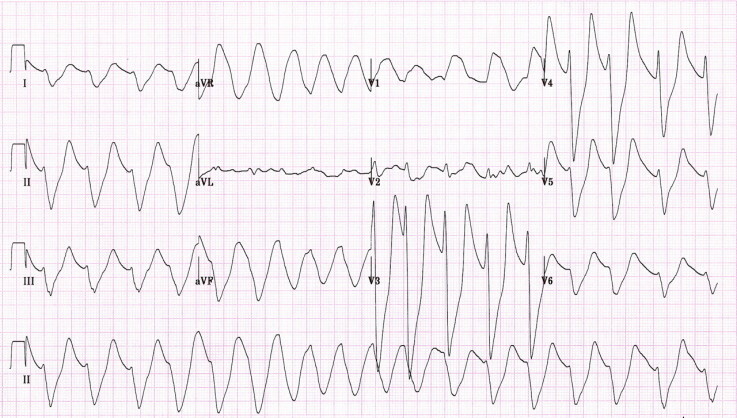 1) What are the EKG manifestations associated with hyperkalemia? Do these changes occur in a predictable order? Hyperkalemia is one of the most lethal and treatable metabolic disturbances faced by emergency physicians. Therefore, its rapid recognition and treatment is paramount to the survival of the critically ill patient. Oftentimes, the EKG is utilized to assist in its early identification at the bedside, before lab results return. Classically, it has been taught that there is a step-wise progression of EKG changes that occur in patients as their serum potassium level rises. Initially the EKG change begins with peaked T-waves in mild hyperkalemia (<6.5mEq/L). As the serum concentration of potassium increases, conduction from one cardiac myocyte to the next is impaired, resulting in increases in the PR intervals, flattening/disappearance of the p-waves, and then widening of the QRS with moderate hyperkalemia (6.5-8.0mEq/L). Finally, as serum potassium continues to rise, there is further widening of the QRS until it merges with the T-wave producing the classic “sine-wave” pattern on EKG; eventually ventricular fibrillation or asystole ensues in severe hyperkalemia (>8.0mEq/L). Although there is evidence in the medical literature that this pattern does exist, some studies have shown that when EKG changes occur, they may not progress in the expected step-wise fashion. Patients may progress from normal sinus rhythm to ventricular fibrillation as their first EKG manifestation of hyperkalemia (Dodge, 1953). In addition to the classic EKG findings of hyperkalemia, elevated potassium levels may also manifest as sinus bradycardia, right or left bundle branch blocks, and 2nd and 3rd degree AV blocks. Not only is progression of EKG changes unpredictable in hyperkalemia, the EKG is also not a very sensitive indicator of hyperkalemia. In a retrospective review of 90 patients with mild-moderate hyperkalemia (80% with serum potassium levels < 7.2mEq/L) only 18% met strict criteria and only 52% met any criteria for EKG abnormalities associated with hyperkalemia (Montague, 2008). Although studies demonstrate that the probability of having EKG changes increases as the serum potassium level rises, there are case reports of patients with extremely severe hyperkalemia (>9.0mEq/L) that still did not demonstrate any of the predicted EKG manifestations (Szerlip 1986). Some evidence shows that instead of the absolute serum potassium concentration, there may be a higher likelihood of EKG changes when rapid rises in serum potassium concentration occur (Fisch, 1973 & Surawicz, 1967). Therefore, the EKG is a not a marker of how sick a patient may be with regards to their potassium level. Have a low threshold to treat a patient with hyperkalemia, whether or not their EKG shows classic manifestations. Do not to feel a false sense of security with a lack of EKG findings in these patients, and understand that the patient’s EKG may change rapidly into a lethal arrhythmia. 2) What is the role of Kayexalate in the treatment of hyperkalemia? Kayexalate (Sodium Polystyrene Sulfate) is a cation-exchange resin that was approved in 1958 as a treatment for hyperkalemia by helping to exchange sodium for potassium in the colon and thus excreting potassium from the body. Although this drug has been used for a numbers of years as an adjunct to more acute treatments, there are two potential problems with its use. Firstly, there is little to no evidence that Kayexalate effectively reduces serum potassium levels. The two original studies promoting its use, often cited in literature, were published in the New England Journal of Medicine in 1961. The methodology of these two trials was completed without any controls, included multiple confounding variables, a lack of rigorous statistical analysis, and demonstrated minimal if any effect of Kayexalate on serum potassium levels (Scherr, 1961 & Flinn, 1961). Furthermore, a 1998 study also failed to demonstrate a statistically significant difference in serum potassium levels at 4, 8, and 12 hrs after administration of 30g Kayexalate with sorbitol compared to placebo controls (Gruy-Kapral, 1998). In addition to the lack of evidence demonstrating any efficacy, there have been multiple case reports of intestinal necrosis, GI bleeding, and intestinal perforation secondary to Kayexalate (Rogers, 2001 & Rashid 1997). In 2009 the FDA responded to these case reports by placing a warning on Kayexalate for these effects. The warning stated that the complications were primarily seen in patients who received Kayexalate along with sorbitol, and deemed sorbitol to be the primary culprit. Most Kayexalate preparations carried by hospitals, however, have sorbitol already mixed into them, as the powdered version of Kayexalate alone is not easily available. Due to the lack of literature showing any benefit of Kayexalate in decreasing serum potassium levels, as well as reports of serious side effects associated with its usage, including intestinal necrosis, Kayexalate should play little, if any, role in the treatment of hyperkalemia in the emergency department and upon admission to other hospital services. 3) Is there a threshold serum potassium level or particular EKG finding that triggers you to administer calcium? How do you give calcium when you use it? Generally, calcium is administered to hyperkalemic patients to stabilize the cardiac myocytes by restoring their normal resting membrane potential (Fisch, 1973). It is generally reserved for moderate to severely hyperkalemic patients with cardiac instability. Although there are no clear guidelines or evidence demonstrating the exact point to administer calcium, many clinicians will administer it if: (1) the EKG shows evidence of cardiac destabilization such as widening QRS or loss of p-waves on EKG (N.B. : As discussed in question 1, EKG findings in patients with hyperkalemia can vary from patient to patient, and patients with severely elevated serum potassium levels may not manifest concomitant EKG findings); (2) Serum potassium levels above 6.5-7mEq/L regardless of the presence of EKG changes; or (3) rapid rises in serum potassium levels. As a general rule, however, have a low threshold to administer calcium. There are two options when administering calcium: calcium gluconate and calcium chloride. Both types of calcium work relatively quickly in restabilizing the cardiac myocyte membrane, within 3-5 minutes. Calcium chloride contains three times the concentration of calcium compared to calcium gluconate. Therefore, 1gm of calcium chloride is approximately equivalent to 3gm of Calcium gluconate. Historically, calcium chloride was recommended over calcium gluconate because it was believed that calcium gluconate required first pass metabolism in the liver in order to become bioavailable to cardiac myocytes. However, Martin, et al. showed that in patients undergoing liver transplant (i.e. no liver to perform first pass metabolism) serum calcium concentrations rose equally in patients given calcium chloride or calcium gluconate (Martin, 1990). A small study of pediatric burn patients found similar results (Cote, 1987). Although this evidence is not directly applicable to hyperkalemic patients in the ED, it runs counter to the previously held beliefs concerning first pass metabolism of calcium gluconate. Calcium chloride is still recommended in the crashing patient due to speed of administration per volume. Calcium chloride, however, does pose a very serious risk for the development of tissue necrosis if it extravasates into the surrounding tissue (Semple, 1996). Therefore, it must be administered via a central venous line or a large bore, well-placed peripheral line. Calcium gluconate, however, can be administered through a small peripheral IV if needed, as its risk of tissue necrosis is much less. Patients should be on a cardiac monitor when receiving calcium infusions. 4) When do you re-dose patients? When treating patients with hyperkalemia, we often forget to re-dose patients after their initial treatment is given. In terms of calcium, a second dose can be administered after about 5 minutes if EKG changes persist or worsen. Although its effect is quite rapid (within 3-5 minutes), it only stabilizes the cardiac myocytes for approximately 30-60 minutes (Weisberg, 2008). After this time, a repeat EKG may be necessary, along with a repeat serum potassium level, and an additional dose of calcium. In terms of albuterol, if the appropriate dose of 20mg (nebulized) is given, its effect usually lasts for approximately 2 hours after which time it may require re-dosing. Note that the dose to treat hyperkalemia is approximately four times the amount normally given to an asthmatic or patient with emphysema for respiratory complaints. Insulin is normally administered as a 10 Unit IV bolus along with 1-2 amps of D50. When given as an IV bolus, the intracellular effects of insulin will last for approximately 4-6 hours after which it may need to be re-dosed. This entry was posted in Uncategorized and tagged electrolytes, nephrology, renal. Bookmark the permalink. Swami, well done, as always. I like to give furosemide +/ – IVF as well. to post a leave a responsea response 🙂 I do have some questions for you if it’s okay. remarks look like written by brain dead individuals?